My great-great-grandmother Ida was born in 1850 and died in 1931. My grandmother would have been almost 18 when her grandmother died. She never told me any stories about visiting her big house in Delaware, but my aunt remembers hearing about it. It was on the Delaware River, near Philadelphia. My grandmother and her siblings would take the train with their mother from south Georgia. My mother remembers playing dress-up in Ida's wedding dress in the 1950s. At some point the dress was given to our cousin Ellie who just sent it back, September 2018. 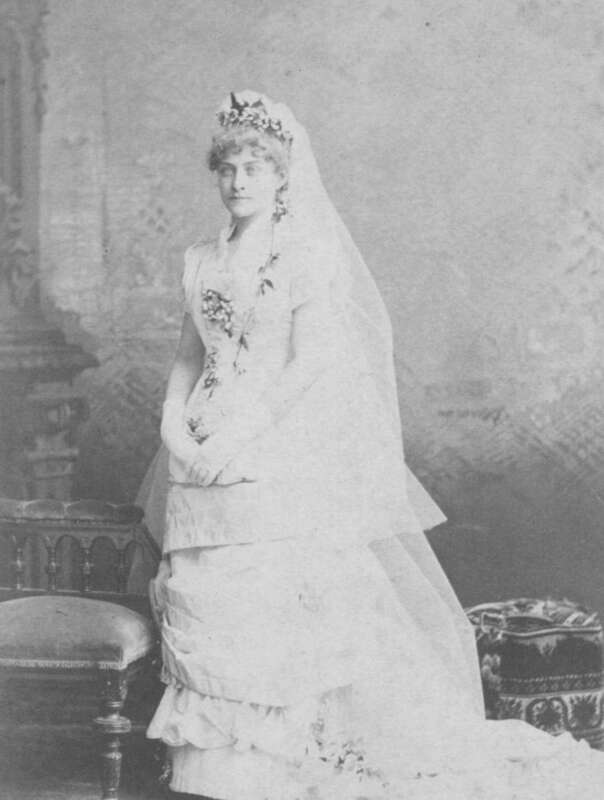 I don't have a photo of my great-great-grandmother Ida in her wedding dress, but I do have a photo of another great-great-grandmother, Anna, in her wedding dress in 1877. This woman would have been a contemporary of Ida's. 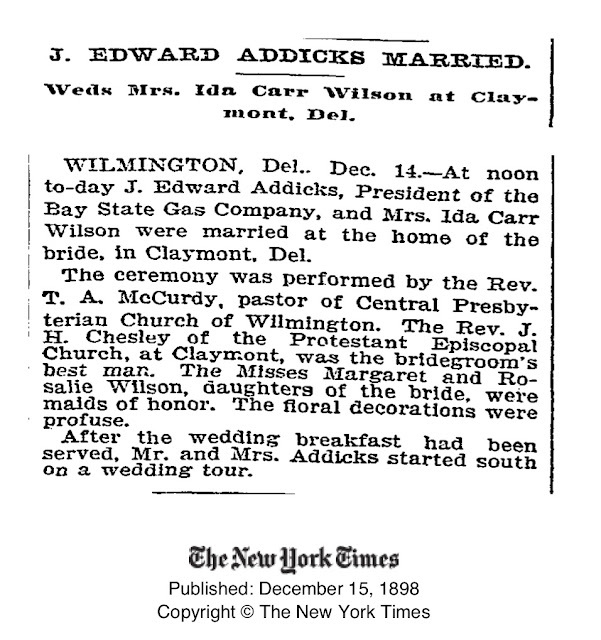 Her son James and Ida's daughter Rosalie married sometime between 1898 and 1913. 1898 is when Rosalie was in her mother's second wedding and 1913 is when my grandmother was born. Ida's best friend was named Rosalie Butcher. Her sister Laura was married to a natural gas tycoon named Addicks. 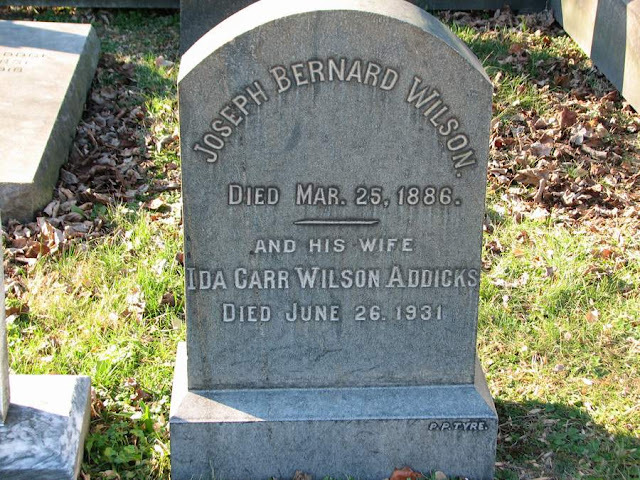 Ida got married to a man named Wilson. She named her first daughter for her best friend Rosalie. When Laura died, the tycoon Addicks married her sister, Rosalie, Ida's best friend. But Rosalie suspected her husband and Ida were having an affair so she divorced Addicks. And sure enough Ida married him next. Way too much drama for me. I'm not sure at what point in the proceedings Ida's husband died. There was a 12 year gap where she was just a widow. 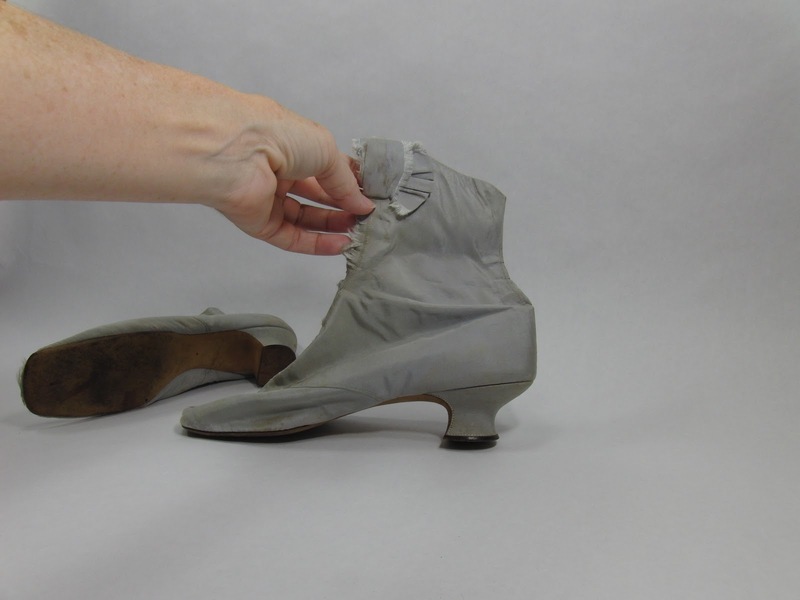 I thought the dress was from Ida's second wedding to J. Edward Addicks in 1898, which I can read about on Wikipedia, but upon examination I see that the name written inside the shoes is Miss Carr. 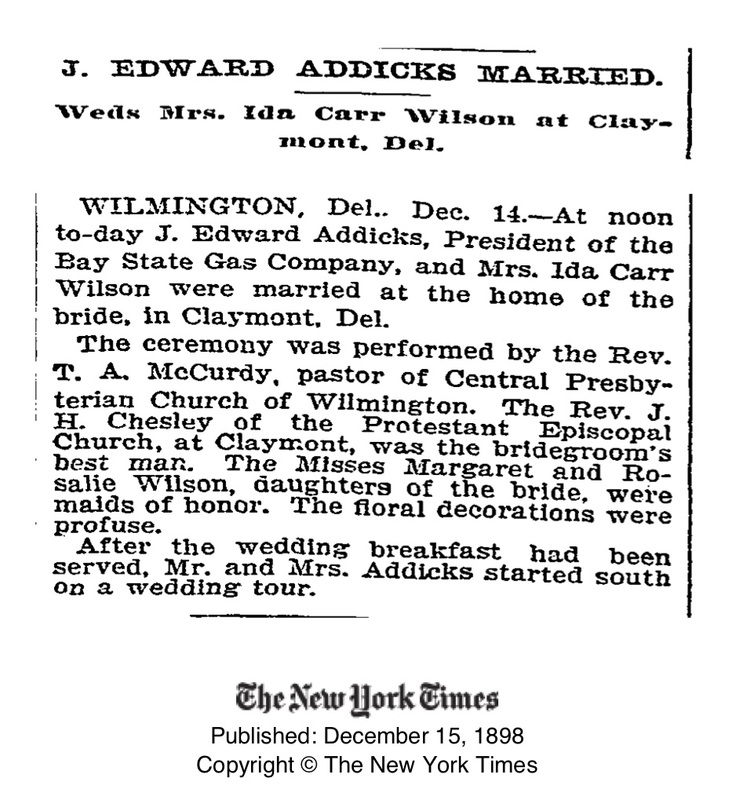 She was already Mrs. Wilson when she married Mr. Addicks, as evidenced by the New York Times wedding announcement. 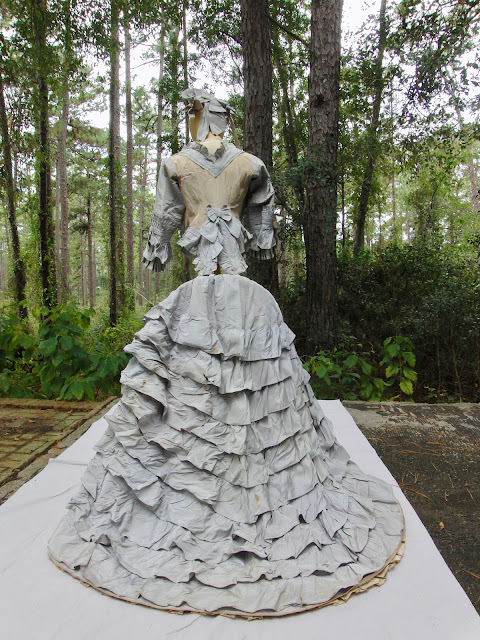 Ellie speculates maybe Ida wore this dress for both weddings. I don't know about that. It was probably close to 20 years between them. Surely the style changed. But it was customary in those days to not have a dedicated wedding dress. 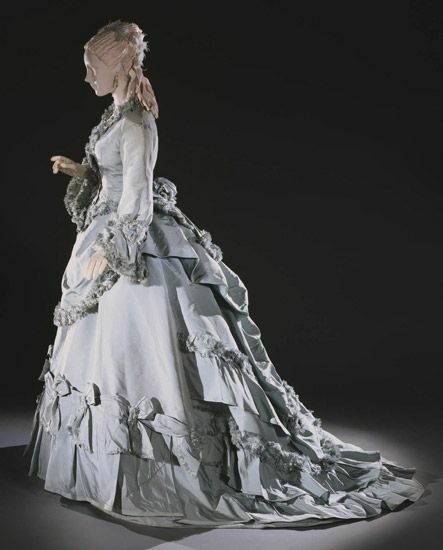 Even Queen Victoria repurposed her wedding dress into a ball gown. Most women just wore their very best dress to their wedding. This dress is indeed totally over the top. I can see how Ida might want to wear it again. I can't read the document showing the date Ida married Joseph Bernard Wilson to see the earlier possible date for this dress being made. It was easy enough to find a picture of the marriage record online, but I'm too poor to shell out $9 to Ancestry.com to get a look at it bigger than a thumbnail. Times have changed. I don't have a lot of money to throw around. My ancestors had money, oh yeah. According to the website of the people who currently own the ancestral home, Anna's husband, A. Heywood Mason, was worth 2 million dollars in 1890. This was at a time when the entire federal budget was 384 million dollars. I'm not bragging, I'm frankly disgusted by that. As bad as the sociopolitical situation is these days I just have to shrug at the question "Where did we go wrong?!" The very beginning? Anna's husband got his money the same way rich people do it today — from his father. James S. Mason immigrated from England in 1830 and built a factory making ink and shoe polish. He had 200 employees at a steam powered factory in Philadelphia at the peak production of James S. Mason & Co. I expect the CEO got rich and the workers didn't, same as today. Anyway, judging by Ida's dress, she was pretty well taken care of too. She seems to have marched right into the tailor on her very narrow feet and said, "I'll take the works." A few years after Anna and A. Heywood Mason got married they came down to the piney woods in a horse drawn coach with their wee baby James. They stayed in an opulent hotel for the winter. They went hunting and had a big time socializing with other rich folks. They liked it so much in South Georgia they bought land for all their hunting needs, complete with a big Gone With The Wind looking plantation house. (This all happened after the civil war. There were freed slaves to take care of the house and land but the Masons paid them and taught them to read and whatnot.) When I was a little girl my aunt and uncle lived there. It was right through the woods and I used to visit them. I took tennis lessons on their tennis court and my cousin Sherry taught me how to ride a horse (I didn't go nuts over either of those activities, preferring to read and make things.). My aunt and uncle sold the big house when I was in college. But my grandmother's descendants retain the part of the land that she inherited. This is where I live in my tiny house. 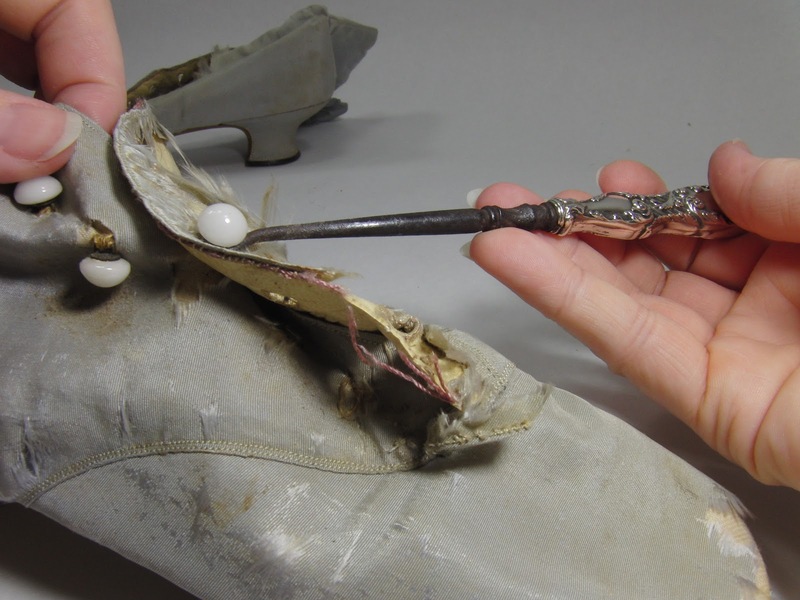 When it comes to heirlooms my grandmother was just not set up to conserve textiles. She was terrible at taking care of anything that wasn't improved by setting it on fire. She was an early proponent of prescribed burning for these forests. Our woods are a beautiful example of a diverse native ecosystem. But that enormous oriental rug in her old house where my aunt lives now, it is in a sad state. It would probably be worth a lot if it hadn't been in an unairconditioned house in the South for the last 130 years. Linen tablecloths and dresses are equally degraded. Some of the furniture is still around, but honestly most of it is pretty ugly. Victorian taste was grotesque. I feel like the design of this dress has value for costume purposes even if it is so damaged as to not be usable as a garment. I can measure and document it and take a lot of photos. Somebody could refer to this information to create a replica as a period costume. 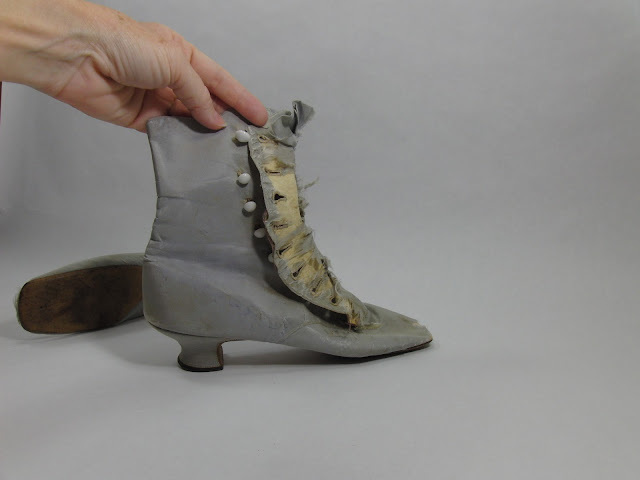 If you have a membership to Ancestry.com you can find out exactly what year Ida Carr got married the first time and pinpoint when this was the height of fashion in the Philadelphia area. I'm curious about the technology they could have used to make this dress. I looked on the ISMACS site (sewing machine collectors) for what sort of industrial sewing machines they had available then. 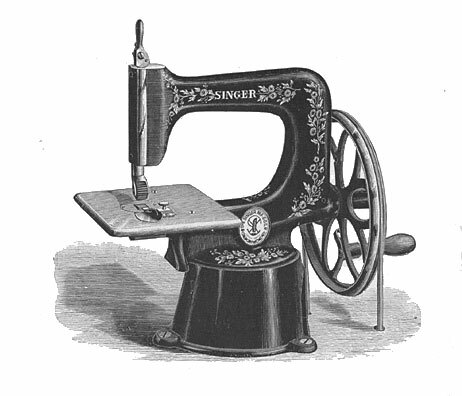 Singer introduced a vast selection of industrial sewing machines in the 1890s. But if this dress was for a wedding 15 or more years before that there would have been a much reduced set of machinery to make it. 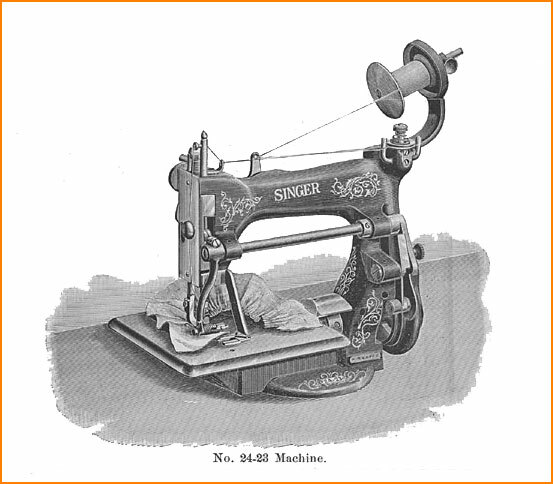 The tailors would have been limited to a few kinds of chain stitch or lock stitch machine driven by hand crank. I think the treadle came along around 1880. This dress may even pre-date that innovation. This is the 24-7 crimper. It didn't have a needle, it just folded and pressed the fabric. Would have made those 1/4" hems go faster for sure. I don't think the crimper with the treadle was invented yet when this dress was made. Question: am I wrong to call it a dress if it's a skirt and jacket? What would Ida call this? An outfit? An ensemble? I will now start referring to it more specifically by the separate parts. I can't get over the color of this outfit. It's basically like if an old sepia tone black and white photo was actually a color photo and everybody was just dressed in shades of beige and gray in the 1800s. Since when do taupe and gray go together? Maybe not since 1900. The jacket of this dress weighs 12 1/2 ounces. It has stiff interfacing in the bottom half of the sleeves but the rest of the jacket is quite soft. The bodice is a taupe silk low luster satin with silk faille or taffeta sleeves and embellishments. I'm not sure what to call the fabric. 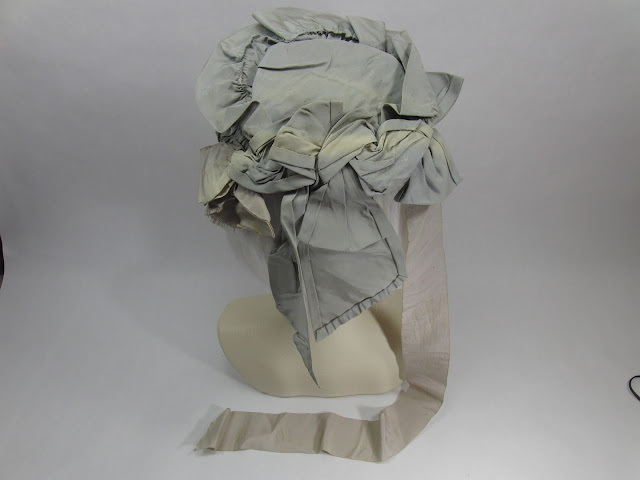 The grayish stuff is quite stiff where the taupe is soft, like the silk blouses I used to wear to work when I had a job. Is it peau de soie? It's very pretty material especially on the back where it is less damaged. For 53 detailed photos with measurements go to the Google Photos album. The jacket from the front had these inward facing ruffles and I'm not sure what they were meant to do. The petticoat would fit me if I removed all my internal organs below my lungs and put on a corset. It's got a 23" waist. The length comes to the top of my ankle in front. There is a train in the petticoat. I can't tell if its got room for a bustle. It's quite heavily gathered up. There are ribbons inside it that I guess were meant to be tied together to bustle it up if you didn't want the train dragging. 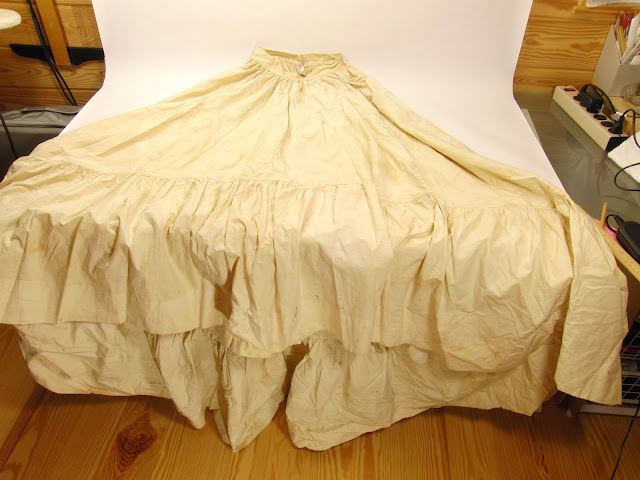 The skirt and petticoat together weigh 6.2 pounds. The skirt alone is 4.2 pounds. Link to more photos and opportunity to comment on each. and they are perfectly flat, no gathers. I don't know what happens when you bunch up all that petticoat under there though. It is hard to get a picture of this skirt all at once. 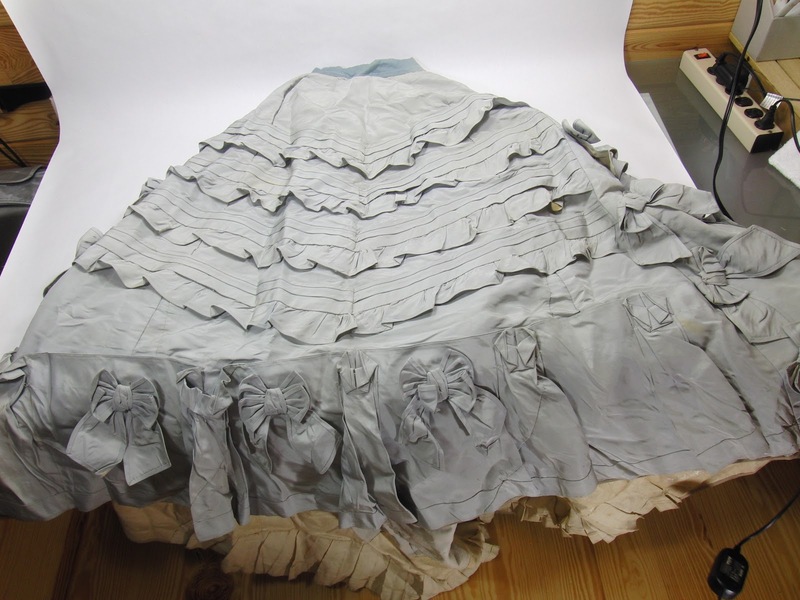 There are 4 ruffles arranged on the front of the skirt from about the tip of the jacket to just below the knee. They have a bit of a V shape to them. 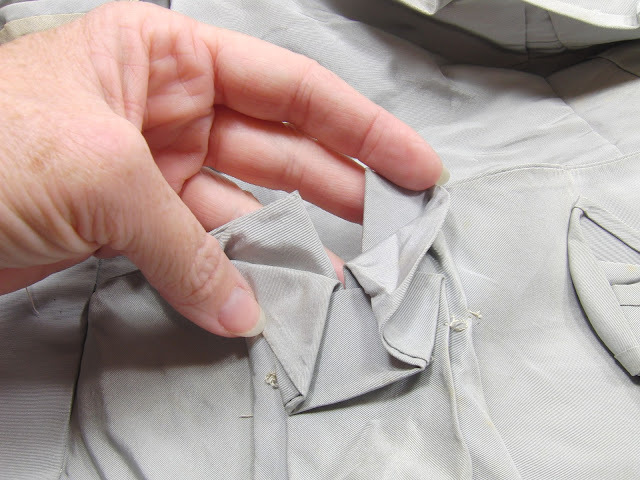 They are made of bias cut strips of silk taffeta with a doubled 1/4" hem folded to the front. They are hand gathered and hand attached to the skirt. 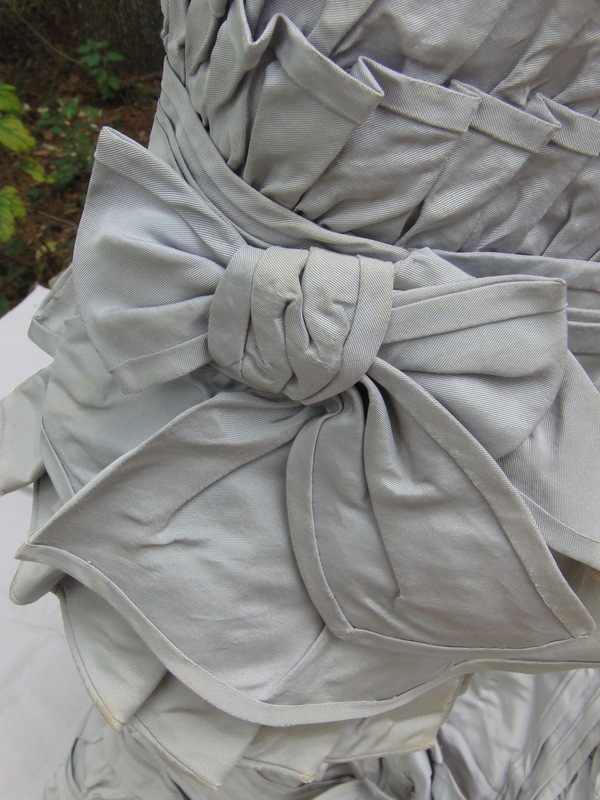 The ruffles are topped with bias cut banding with more of that 1/4" folded hem. Some of this has a mesh backing. The bottom front business is a 15 1/2" wide bias cut silk band with a 1" hem on the bottom and a 2" piece sewn on the top so these weird pleats can be turned down. 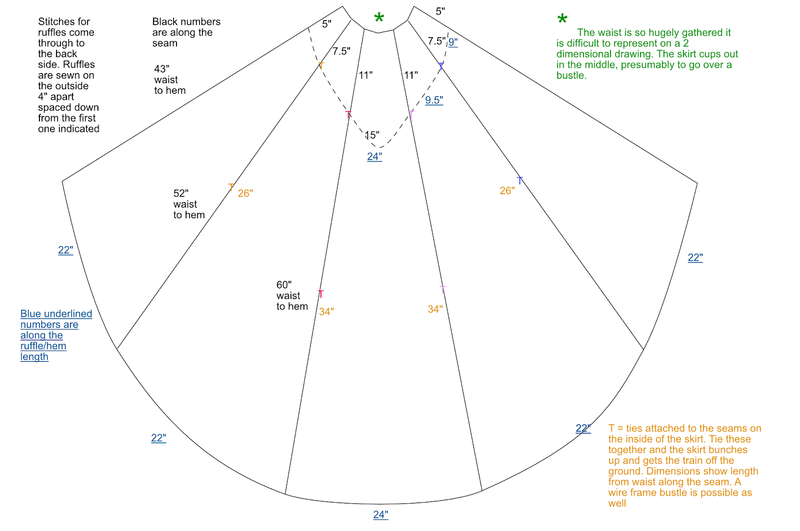 Basically each pleat takes 11 1/2" of fabric and turns it into 2 1/2". This happens five times across the front of the skirt. It's simply a device to put more fabric in this garment. I have this image in my head of a young woman and her maid going into a tailor's shop carrying three bolts of fabric each. They drop them on the counter and the lady says, "I've just come from a trip to France where I purchased enough fabric to make new draperies for the entire new wing. But I've changed my mind and I would like all of it made into just one dress." The bias cut is no joke. They must have just converted several bolts of taffeta into one long 12" strip and then they cut that down into all the other trim profiles. I looked up how wide fabric was in the 1870s. Standard looms seemed to be turning out fabric a yard wide, so only 36". The front design goes like this. # is a gather and * is a bow. I undid one of the gathers and measured 18" from the side seam to the first bow. 18" x 5 = 90" for the band across the front before it's gathered up. After it's gathered and sewn on it comes to 44". That's a 15 1/2" strip too, not just 12". That's two yards of fabric just to make that decoration. Not counting the bows. There are two side panels to describe before I even get to the back. After the band on the front there is a 9 1/2" wide at the bottom and 2 3/4" at the top panel. It is framed out on the back side with two lines of this tape with a folded double 1/4" hem, invisibly stitched from the back. This makes it stiff. I think that's why they keep doing this. These panels are attached on top of the side gores. But wait! There's more! The side panels are backed up with another 2" bias cut ruffle and filled in with 5 bows. On each side. For crying out loud already! Now, on to the back. There are 5 gores on the back of the skirt. The back is so heavily gathered at the waist that they didn't even try to make it flat. They just sewed through the pleats and lined them up against the small of Ida's back like a folded fan. It must not have been very comfortable. It wouldn't matter if it looked funny as the tail of the jacket would have mostly covered it up. In fact they seemed utterly unconcerned about what went on at the top of the skirt. The edge of the waistband isn't even finished. There's no sign of a buttonhole. I wonder if the waistband was replaced later. This seems likely. For an event Ida would probably have her lady's maid sew her into it and then cut the stitches at the end of the night. Flipping the skirt inside out I will measure the gores in the back. The whole thing is backed up with muslin same as the jacket. It's not really lining, just interfacing. 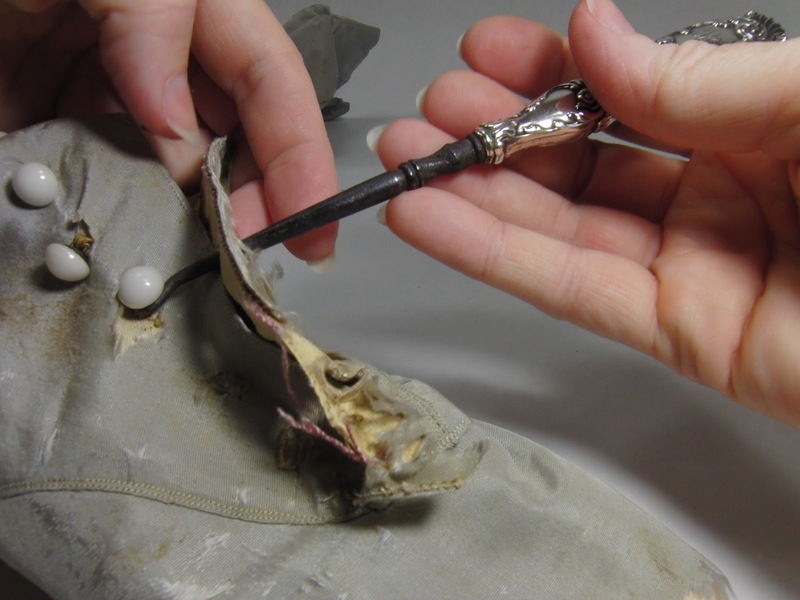 The center back has a clear oval area like a little shelf to show off the ruffles of the swallow-tailed jacket. There may have been a bustle under this business. From the center back waist to the first ruffle on the back is 15". These ruffles are 5 1/2" wide. They are hand gathered seemingly at the same time as the raw edge at the top is folded under. When they are attached to the skirt the raw edge is hidden under the ruffle. The top seam isn't very neat though. It's just all wadded up and tacked on. The hem is still that 1/4" doubled hem folded to the front and blind stitched from behind. 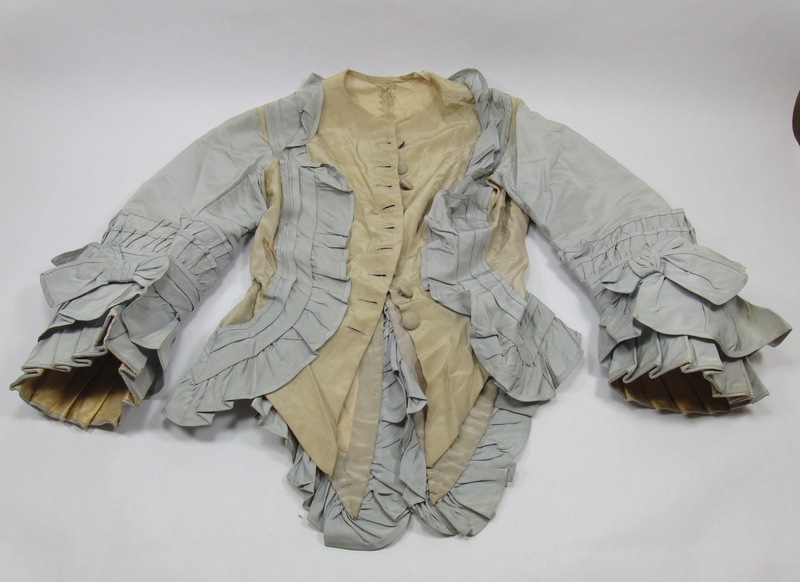 But the ruffles are sewn through the taffeta and muslin interfacing in one motion it seems. 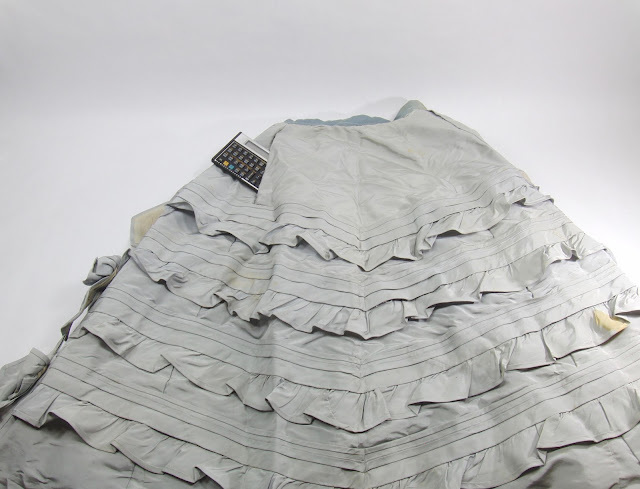 The ruffles down the back are 4" apart at the edges and 4 1/2" apart in the middle. 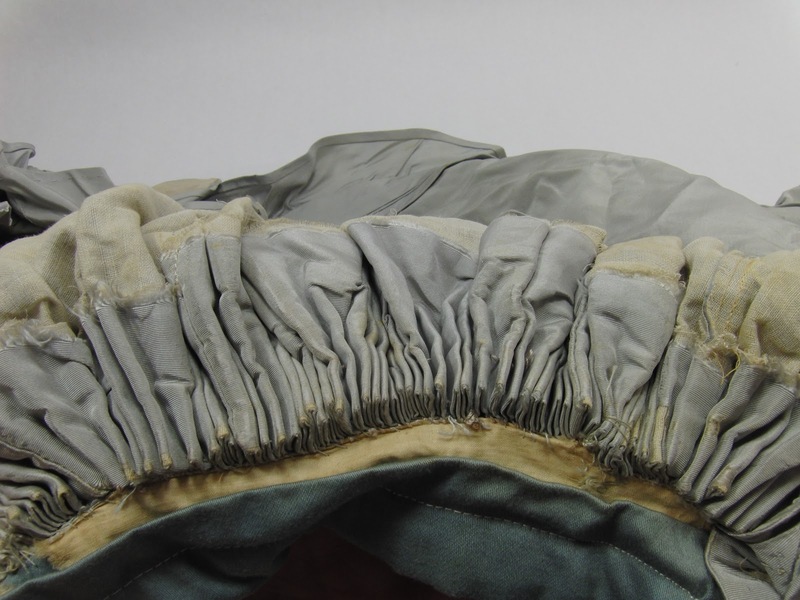 There are 10 ruffles sewn on in an oval. The total length of the back of the skirt (measured on the inside) is 60". 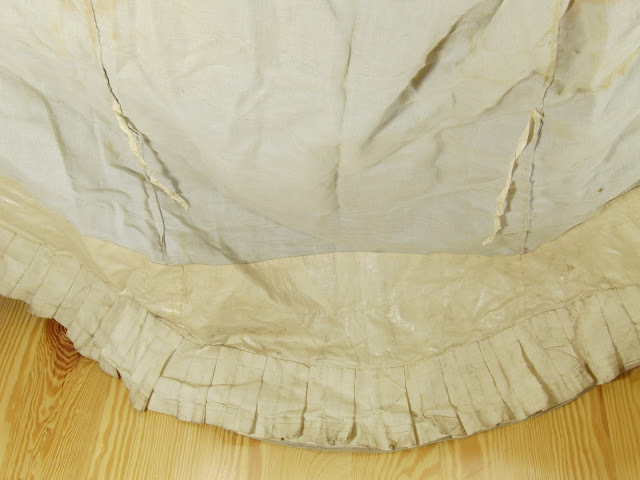 There is a 5 1/2" wide box pleat sewn into the bottom back of the lining of the skirt on top of an interesting polished cotton layer. I feel like this must be to protect the fabric from moisture on the ground? The very edge of the dress is bound in a sturdy tape. 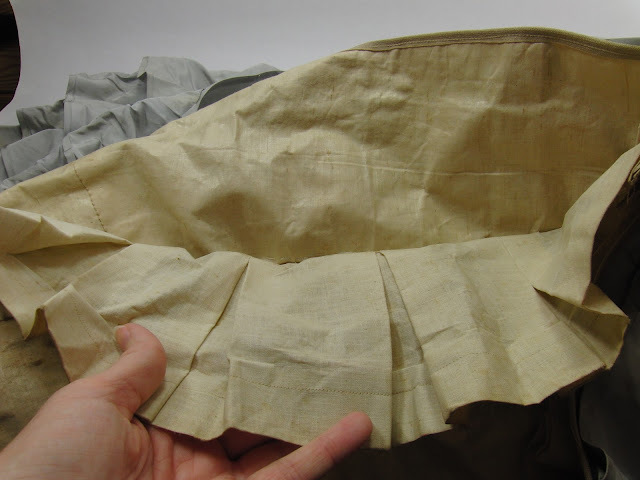 This goes around the silk taffeta, the muslin interfacing, and the polished cotton. But not the box pleat. That's added on after. 14 total bows on the skirt. 3 on the jacket, 1 on the hat, and 2 on the shoes. The two on the sleeves are my favorites. They are special both tails coming from the same side. The bows on the sleeve are different. The tails aim back toward the elbows. I can't figure out how this hat is supposed to go. It has some wire in it to hold it in a sort of crescent shape. There is way too much silk all bunched up on one side. I don't understand why the last ruffle has the raw edge sort of hanging out. And why did they use brown thread to do all these gathers? 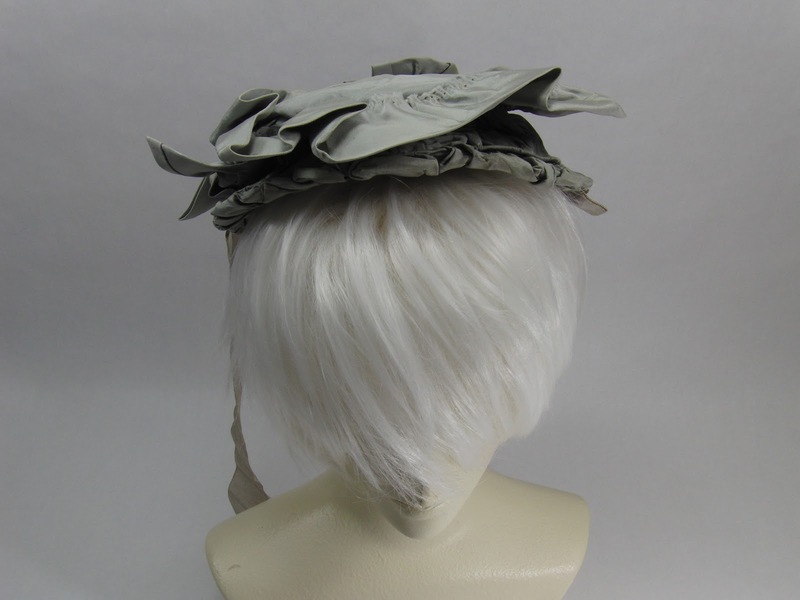 Maybe there was a veil added to the top of the hat for the wedding, similar to the photo of Anna above. 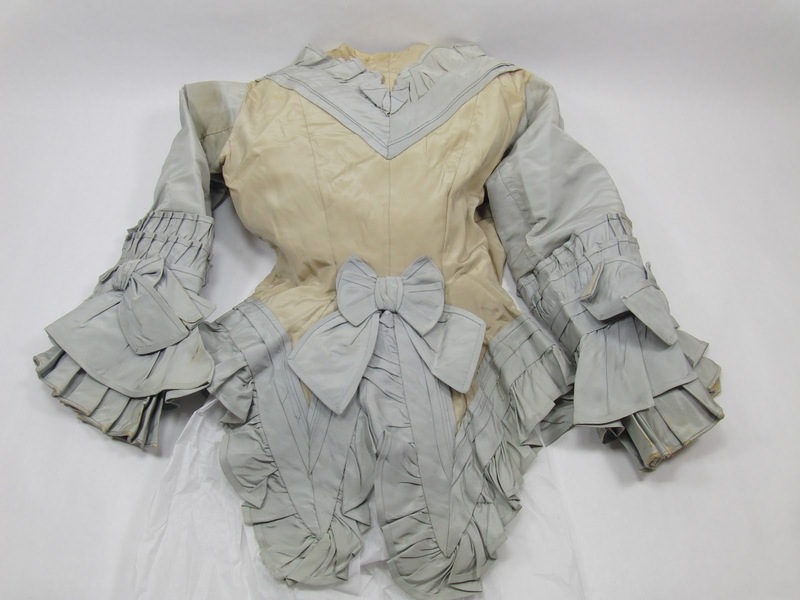 I sent a link to the photos of this dress to Angela Clayton, a YouTuber who sews a lot of frilly dresses and period costumes. (Website/YouTube) This is how I was aware this is a thing that people do, which is why I documented this dress in the first place. She thinks this dress is from the early 1870s, so definitely Ida's first wedding, not the second one. She said it is definitely useful to see pictures of the inside of it and the details of how it was sewn since fashion plates and museum photos don't let you see that stuff. 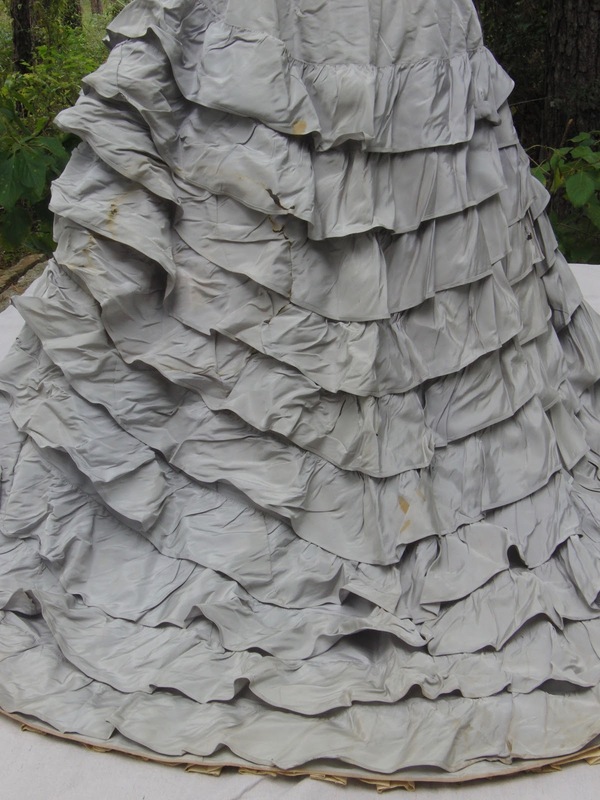 She also thinks that the material looks like faille, not taffeta. And she called that mess at the back waist "cartridge pleats." That is the perfect term and I'm glad to know it. 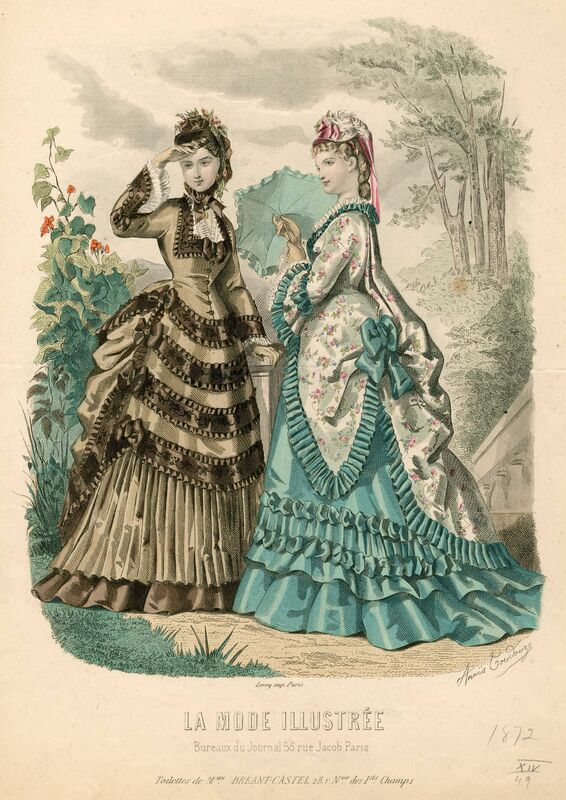 Angela sent me some really interesting links to similar dresses as fashion plates and one from the Philadelphia Museum. Thank you, Angela! 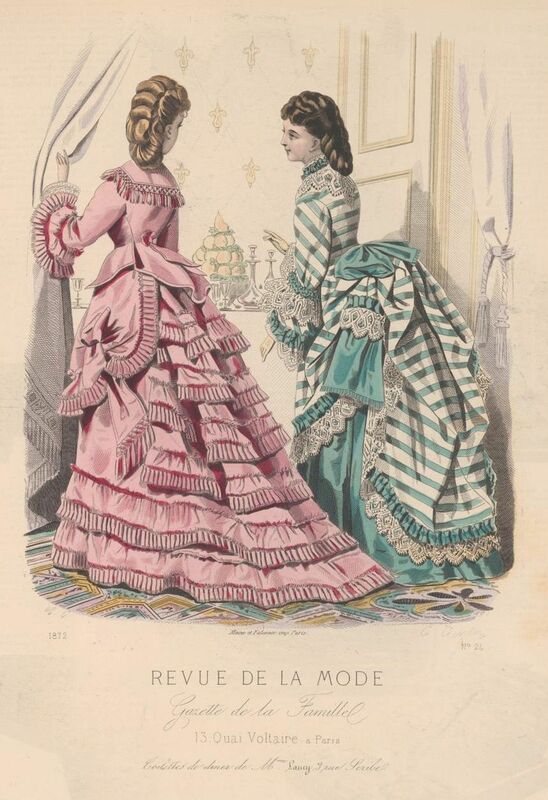 I didn't even know about fashion plates before. 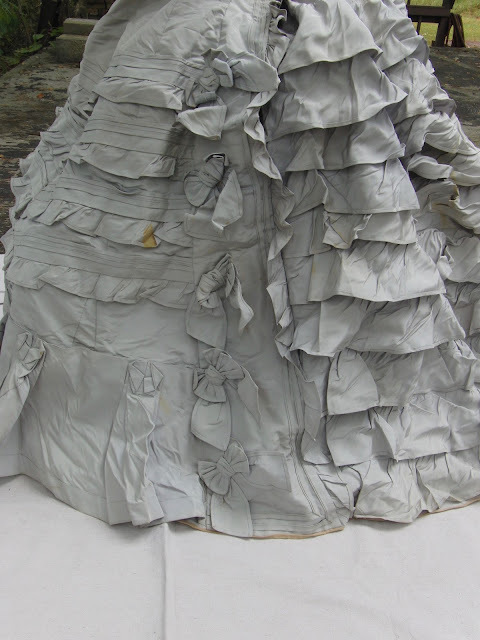 But I was sort of picturing Ida's dress drawn this way instead of thrown over a wicker chair. I still can't believe people wore this stuff. 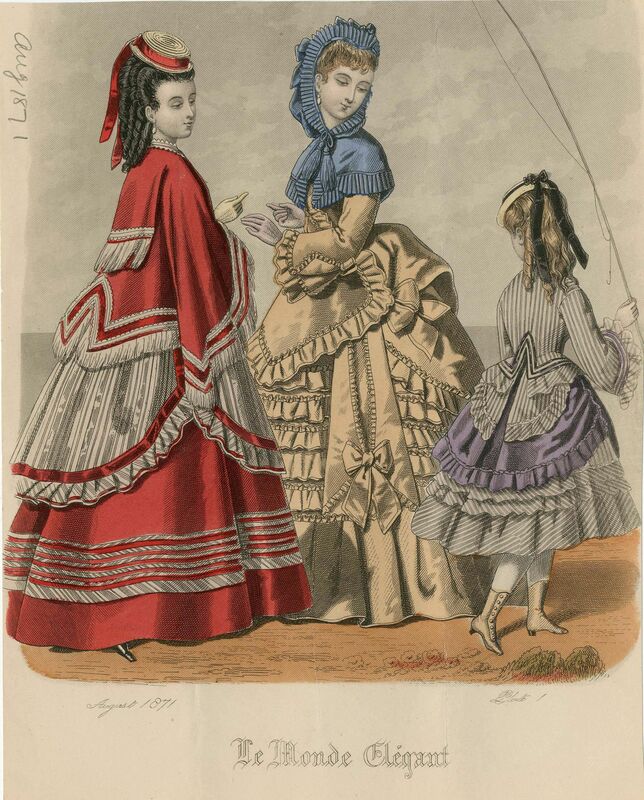 Those bustles are ridiculous looking. I don't understand the point of that AT ALL. It looks like a pantomime horse under a tablecloth. BUY A PITCH PINEY RIGHT NOW! It's simple. Just send me $10 with PayPal and I will know you want a Pitch Piney. I will mail it immediately to your verified address. I'm trying a new marketing approach, sales benefit something of ecological importance. This is no different than everything I make and sell, but I'm interested to see if it matters to emphasize the good cause. I am also going for a very low price point. That may make more difference. If $10 doesn't work I will try something lower. Longleaf pine was one of most abundant tree species in North America before industrialization. Now less than 3 percent of the original forest remains. Half of this is on private land like my family's. Maintaining the longleaf pine ecosystem is a lot of work. 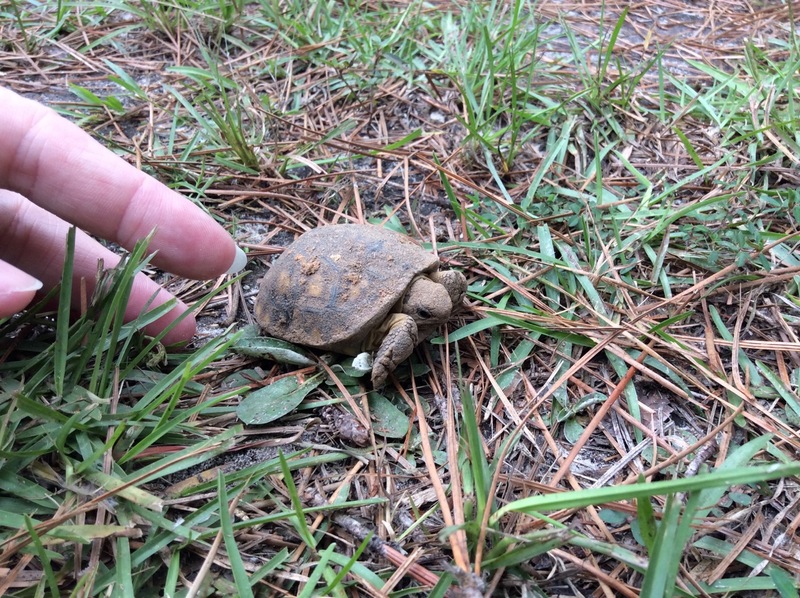 It requires annual prescribed fire to keep the understory open for keystone species like red cockaded woodpeckers and gopher tortoises. I live out here in my tiny house and keep an eye on the property. If lightning starts a fire I run out there with a rake and I put it out before it jumps a fire lane and sets the neighbors' land on fire too. I kill time between thunderstorms doing science communication and making arts and crafts in my lab. I don't have room for any art in my tiny house, so try to sell things online. When I say that buying a Pitch Piney supports conservation of Longleaf Wiregrass Savannah I mean I'm going to buy a can of gas with that money and I'm going to mow some firelanes. Or I may buy groceries. I don't have non-profit status, I just don't get paid at all for anything. I have tools from when I had a job and I hang on to materials I can upcycle. Aside from a branch that fell in my yard this project uses file folders I got with a free file cabinet somebody gave me when they moved. And I have foam core scraps from framing posters for a friend. You can check out my testament to smallness over on my other blog to verify my efficiencies. Longleaf pines were nearly wiped out because they are just so useful. Longleaf is the strongest wood for structural posts. 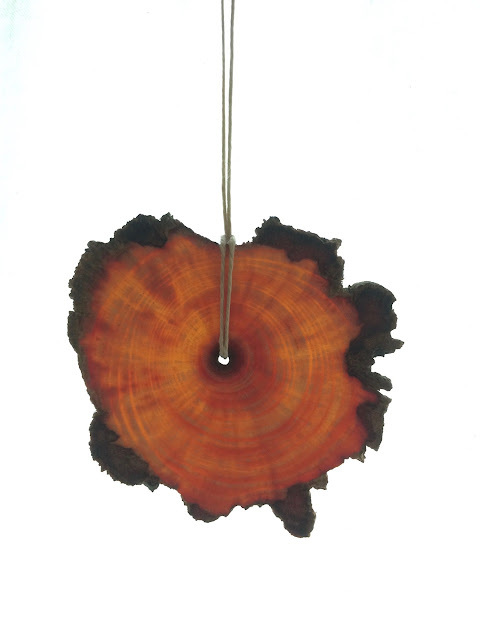 These trees also produce a very useful resin that is distilled into turpentine. 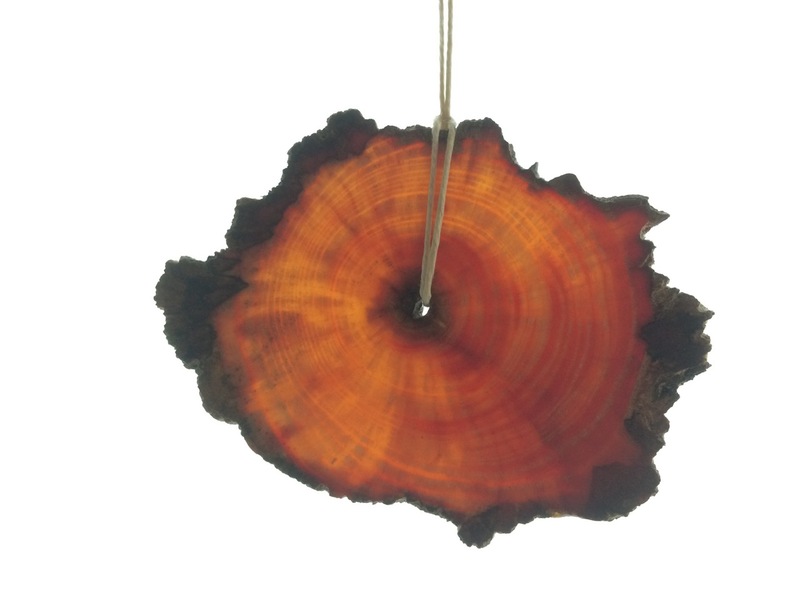 In certain parts of the tree this resin can become so concentrated it stops behaving like normal wood. It actually allows light to pass through it like stained glass. This is the basis of the Pitch Piney project. Here's how they look hanging in front of a sheer curtain in my lab. In addition to being visually striking Pitch Pineys have a pretty strong smell of pine trees. This will grow less pronounced as they outgas. I made a video about them. You could sand them if you're into that. Here's what one looks like sanded. Kind of hard to tell the difference when it's doing its thing. Sanding will release more of that smell. Be sure it doesn't bother you. It kind of makes my face burn, same as latex balloons. But I did a video showing how it goes when you sand one just in case anybody wants to have a go. 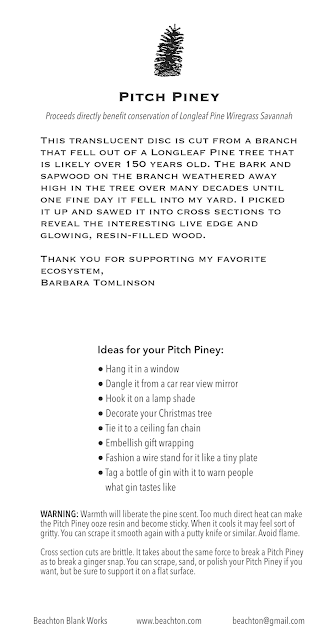 Thanks for your interest in Pitch Pineys! 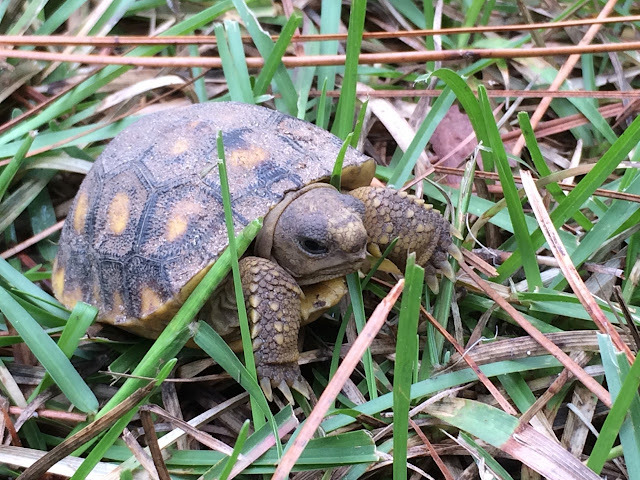 Here's a hatchling gopher tortoise I saw in my yard this week. Hatchling Gopher Tortoise, Keystone species in the Longleaf Wiregrass Savannah. My hand is just to show scale. I do not disturb the animals by touching them. Here he is the next day after he got rained on overnight. You can still see his egg tooth! 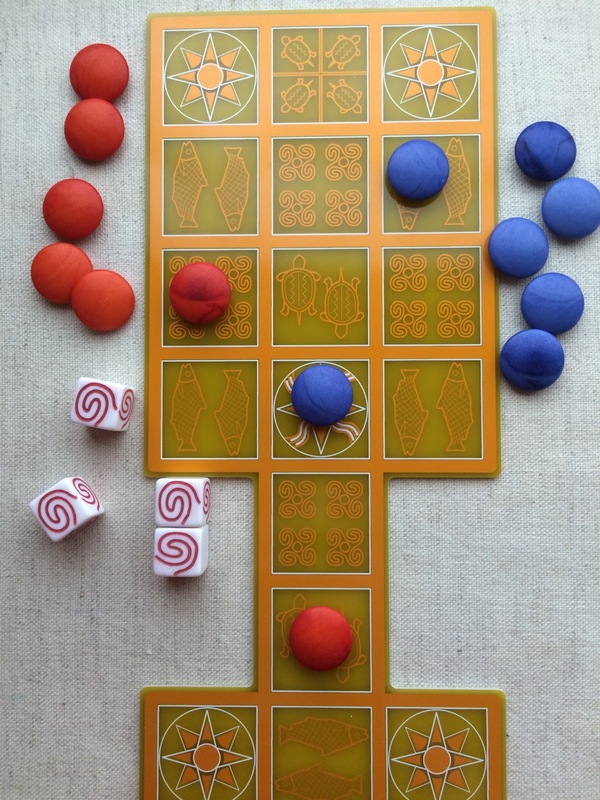 I had an idea for another expansion for my board game — WatUR for three players. 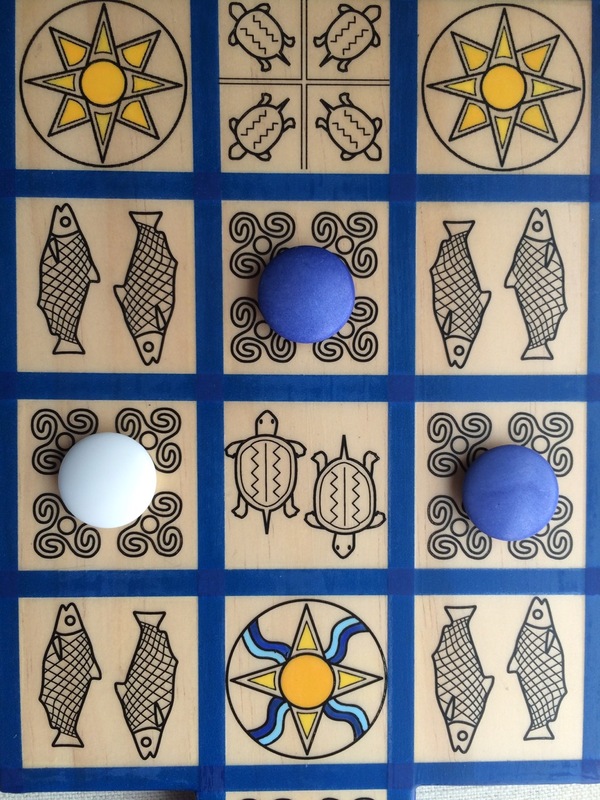 If I add four squares at one end and two on the other a third player could play straight down the center column while players one and two play the regular C shaped routes. But Go stones only come in black and white. A third player is going to need a third color. 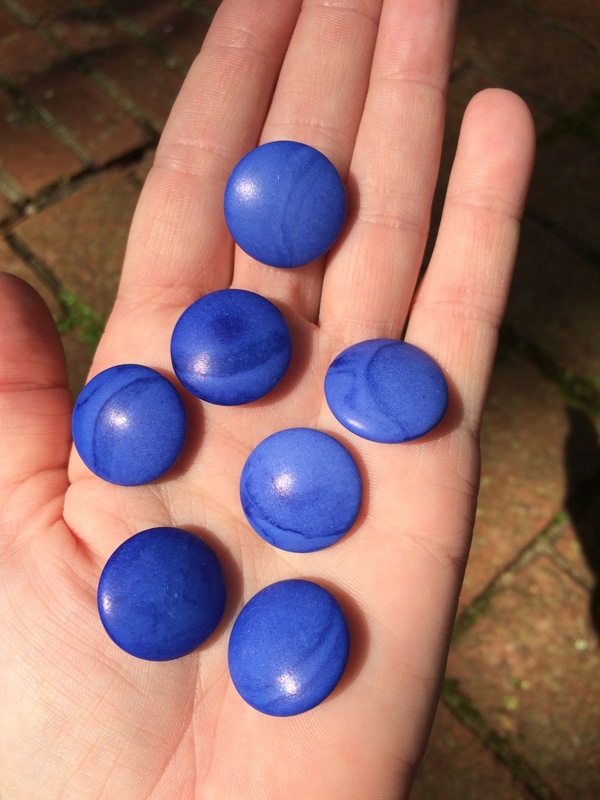 Mesopotamians were heavily into lapis lazuli, so blue is the obvious choice for the third color. 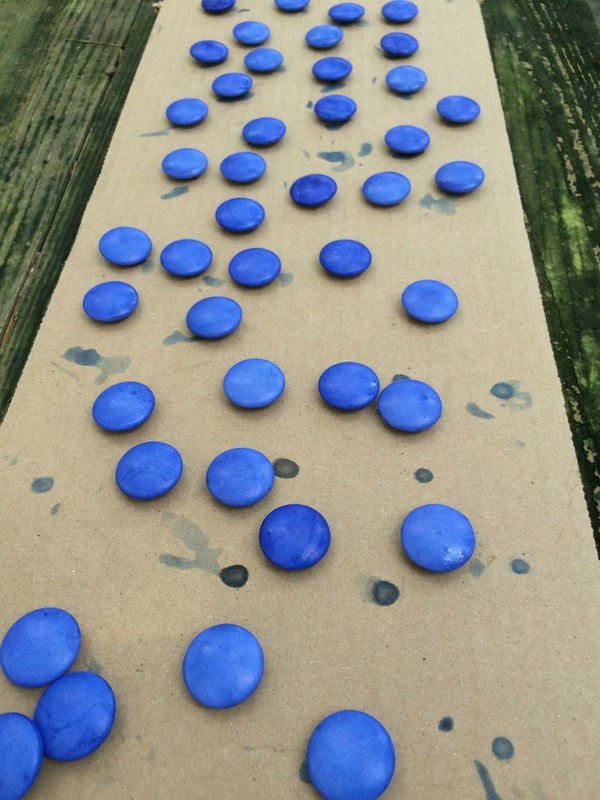 Koplow makes blank blue dice, so I could make those easy enough. I just need to figure out how to make white Go stones blue. To the internet! I found some car restoration enthusiasts who tried dying white plastics black. 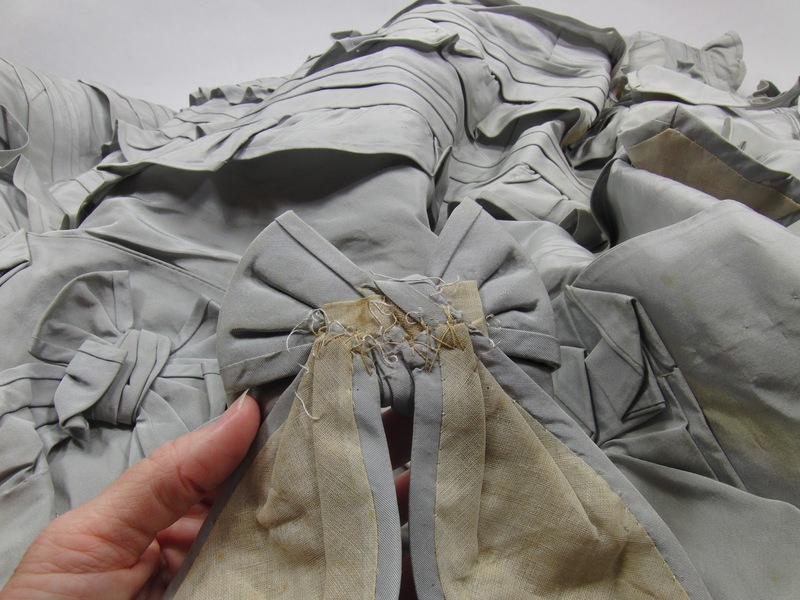 They used Rit Dye More, a fabric dye made specifically for polyester and nylon blends. The Go stones I like are made of melamine. 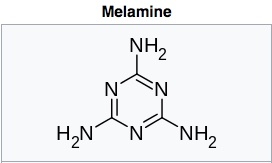 Wikipedia gives a good specific description of melamine. It appears to be just nitrogen and hydrogen. Whereas, also according to Wikipedia, nylon is a general term for a polymer made from mixing two liquids together. The structural elements are nitrogen, hydrogen, carbon and oxygen. Polyester seems to be missing the nitrogen. It's just hydrogen, oxygen, and carbon. I'm not sure what that means for getting the melamine to bond with a dye. 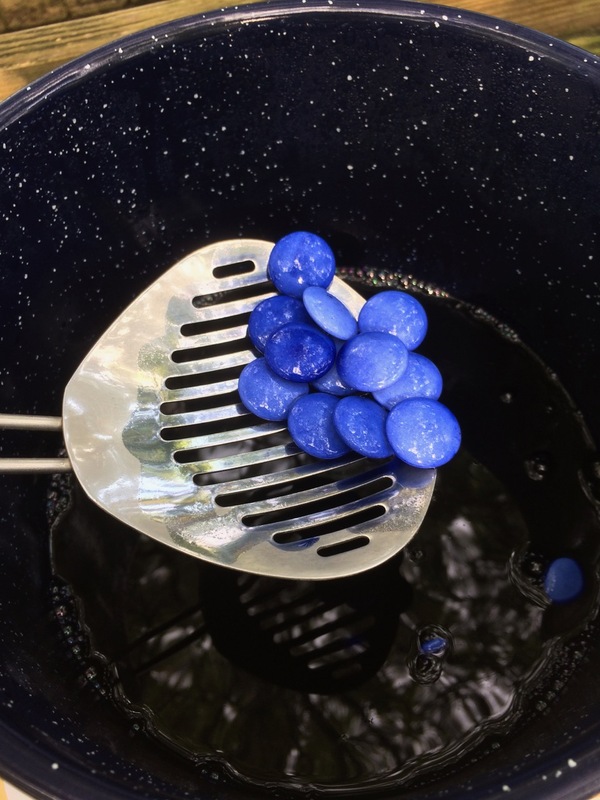 I know that the thermoplastic polymers absolutely cannot be dyed. Polypropylene and olefin fabrics are in this category. If the pigment is not in the vat when it is molten plastic it's never going to happen. (This makes those fabrics extremely stain resistant, as you can imagine.) So I thought I'd compare that molecule with what I've got. I'm no chemist, but it doesn't look remotely the same to me. I think I've got a chance. I searched online for who sells the Rit Dye More — all the major craft chains and Walmart, but not Target. I went to town and bought a bottle. I had a coupon and got it for under $3. The dye instructions for fabric require you to keep the dye bath almost boiling the whole time. This sounds totally reasonable to me. They use melamine to make cooking spoons. It will be fine. I wanted to give the dye the best possible chance of working so I decided to scour the stones first. 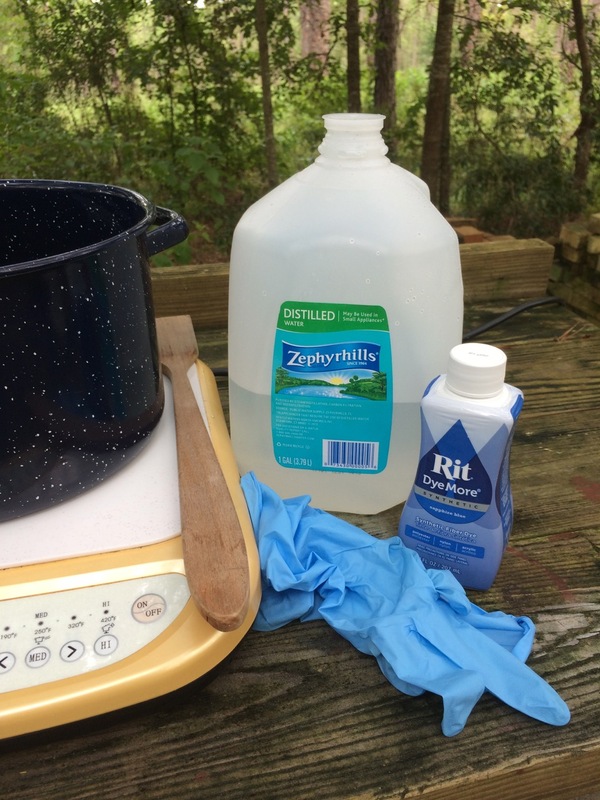 I combined washing soda and water in my dye pot and brought it to a boil. 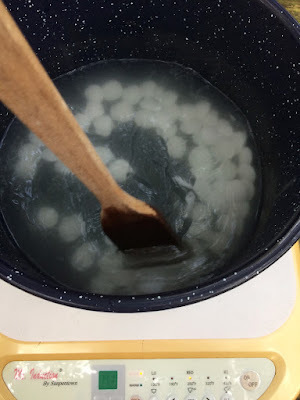 I put in 70 white Go stones and stirred it for several minutes at a simmer. 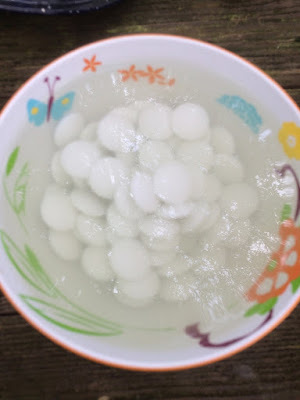 I poured off some of the water and then dumped the stones and the last of the washing soda water into a bowl to stay hot. I wiped out the pot and added distilled water a few inches deep. I set my hot plate on high to bring the water to a boil. When it was boiling I added half the bottle of dye. I didn't add the dish soap that the Rit instructions called for. I thought the washing soda on the stones would serve the same purpose. If I do it again I may use some dish soap just to see if it makes a difference. I think I'll still scour the stones with washing soda though. After mixing the dye well I drained the washing soda out of the hot stones and added them to the pot, still wet. I commenced stirring on medium heat with a wooden spoon. I stirred constantly for about 30 minutes. I entertained myself by dipping other random stuff in there, like polyester ribbon, the lid to the plastic container the Go stones came in, and a nylon cable tie. The cable tie died the best. That's almost instantaneous. I used a stainless steel skimmer to get the stones out of the dye bath. I spread them out on some cardboard to cool. I cleaned up the rest of the work area while the stones cooled. 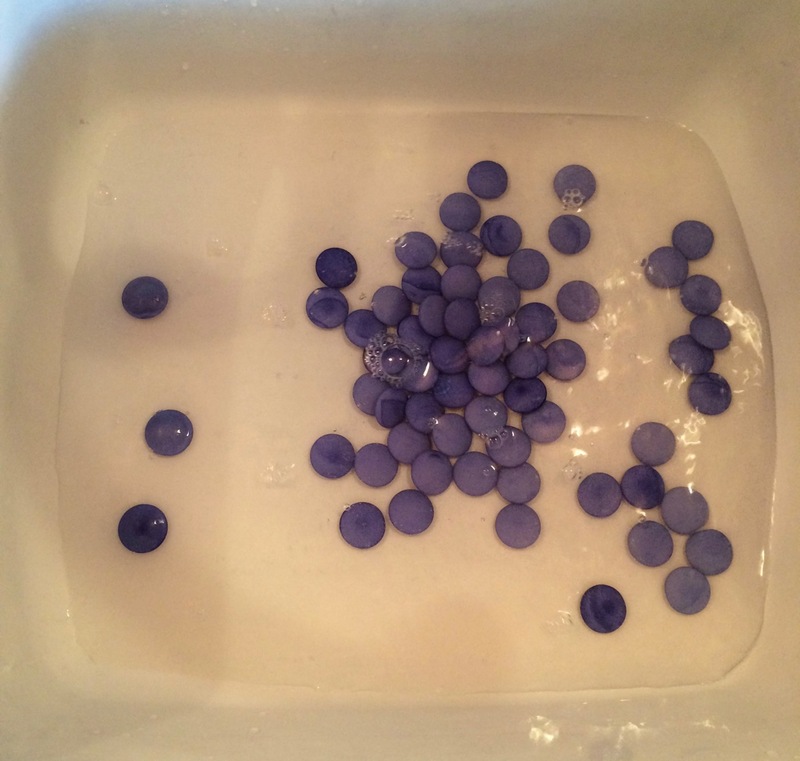 Then I took them to the sink to wash them. 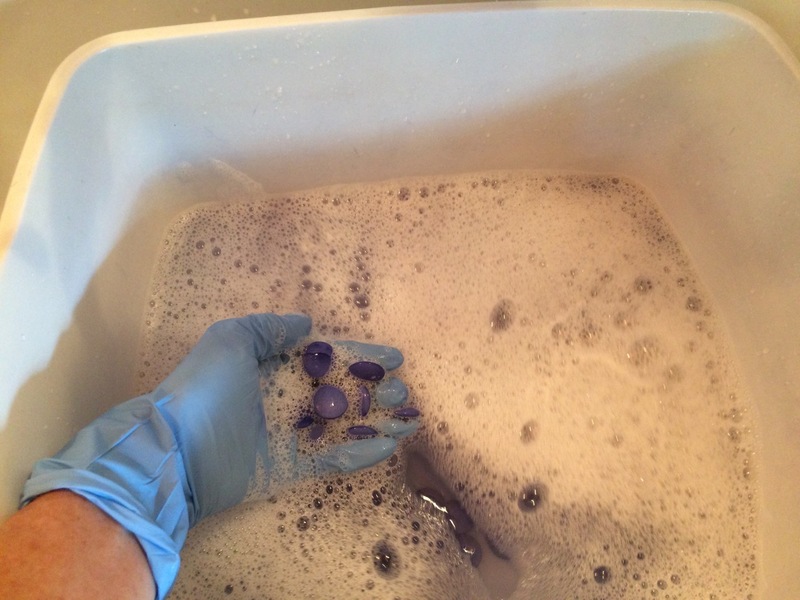 I started with a dishpan of cool water and some dish soap and swished them around good. I was happy to see the water didn't turn too terribly blue. It only took two rinses for the water to stay clear. I dried the stones with paper towels, rubbing each one to be sure it wasn't going to bleed. I'm really pleased with how these turned out. I like the ones that have swirls and color variations. Some of them are just evenly blue. I can pick out sets that go together. The next step is to mail these to California for laser engraving. I can't wait to see if the engraved line shows up in a contrasting white color. The line on the white ones is sort of brownish, but if you scrub each one with a toothbrush and soap it goes white. I'm afraid if I did that to the dyed stones I'd take some of the color off. But I will definitely test it. 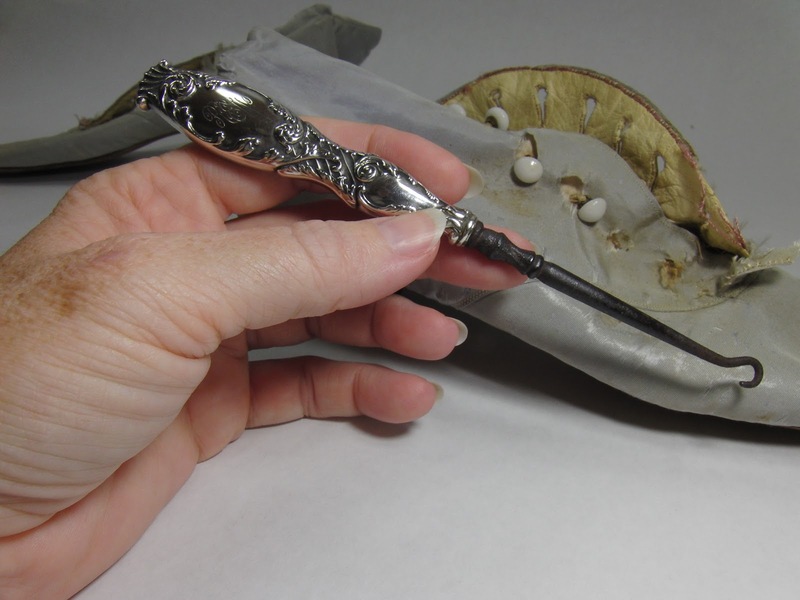 It would be easier to scrub each stone than to press caulk into the engraving and wipe it off. Here's how they look plain on a wooden board. 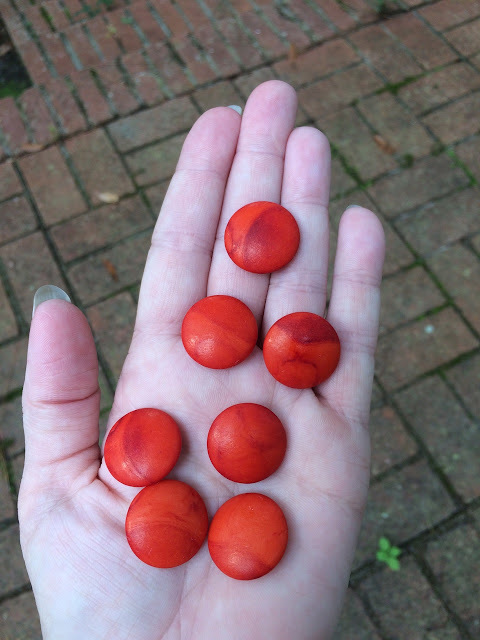 I tried it with orange too, to make stones that look like carnelian. I like it. 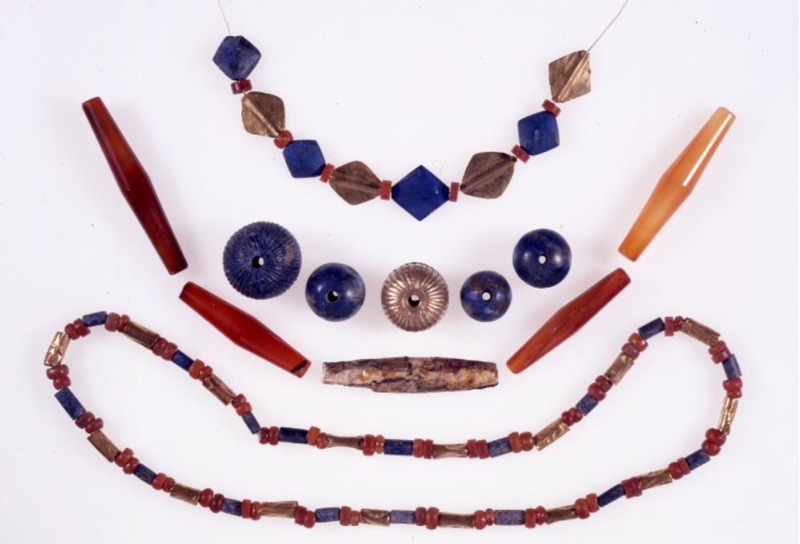 This is the idea behind it, lapis and carnelian jewelry from the time frame of the original Royal Game of Ur. I dyed the lines in the dice with hair dye. Not bad.